There are some 200,000 Bedouin living in the Negev. About half of this population lives in seven townships. The other half lives in 46 villages, of which 11 have been recognized by the State. The remaining population lives in 35 unrecognized villages–approximately 60-70,000 people. The indigenous Bedouin population of the Negev is among the most vulnerable in Israel, and those Bedouin living in unrecognized villages are the most marginalized among them. Living conditions in the unrecognized villages are dire. Because of their unrecognized status, residents cannot obtain building permits, hence all construction is considered illegal. The residents therefore live under the constant threat of demolition and actual demolition. Public services are severely lacking or non-existent and education and healthcare are difficult to access. (1) The Goldberg Committee for the regulation of Bedouin settlement in the Negev was established by the government in 2007. Its recommendations, approved by the government in January 2009, marked a positive change with regards to the Bedouin community. The committee report explicitly criticized past policies of the government in relation to the Negev and emphasized that the Bedouin are citizens of the state and must be treated accordingly. Their needs must be accounted for and they must to be involved in the planning process that determines their future. The Goldberg recommendations acknowledged the historic ties between the Bedouin and their land and called for the recognition of as many villages as possible. (2) The government-appointed Prawer team for the implementation of the Goldberg report which was was approved in 2011. The Prawer report stopped the Goldberg positive developments in their tracks, referring to the Bedouin, again, as a “scattered population”. The main thrust of the Prawer recommendations was to integrate as many Bedouin of the unrecognized villages as possible into the recognized villages and Bedouin townships. This would entail relocation of some 30,000-40,000 residents, with far-reaching ramifications both on those relocated and those absorbing the relocated population, as well as on the structure and social fabric of the Bedouin village. (3) The Begin report, headed by the former Minister Benni Begin, was approved in January 2013. This report resumes the human rights discourse of the Goldberg report and stresses the need to consult with the population. Yet, its practical arrangements are based on the same principles underlying the Prawer Plan, with only minor changes. The Prawer-Begin plans constituted the basis for the Bill on the Arrangement of Bedouin Settlement in the Negev, currently deliberated in the Knesset. The Bill focuses on land ownership arrangements, with significant ramifications on planning. The planning tool by which the Prawer-Begin plan is to be practically implemented is the Regional BeerSheba Metropolitan Outline Plan. 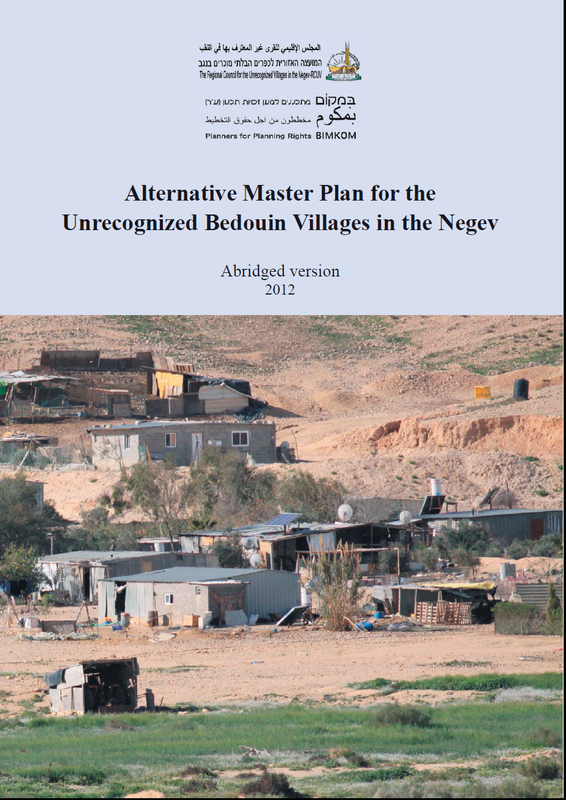 The Beersheba Metropolitan Plan, approved in 2013, however, merely defined a limited geographical space in which new settlements can be established (“Integrated rural-agricultural landscape”), without any commitment to recognition of Bedouin villages, and thus the planning solutions for the villages remain vague. 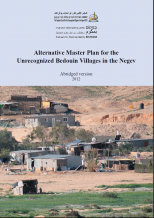 In the years 2010-2012, The Council for the Unrecognized Villages, Bimkom – Planners for Planning Rights and Sidreh – the organization of Arab Bedouin women in the Negev, prepared an Alternative Master Plan which recognizes all unrecognized Bedouin villages in the Negev (AMP). The Master Plan poses an alternative to the government sponsored Prawer-Begin plan and its ensuing bill on the Arrangement of Bedouin Settlement in the Negev. The document presented below, the first of its kind, is an abridged version of this Plan.